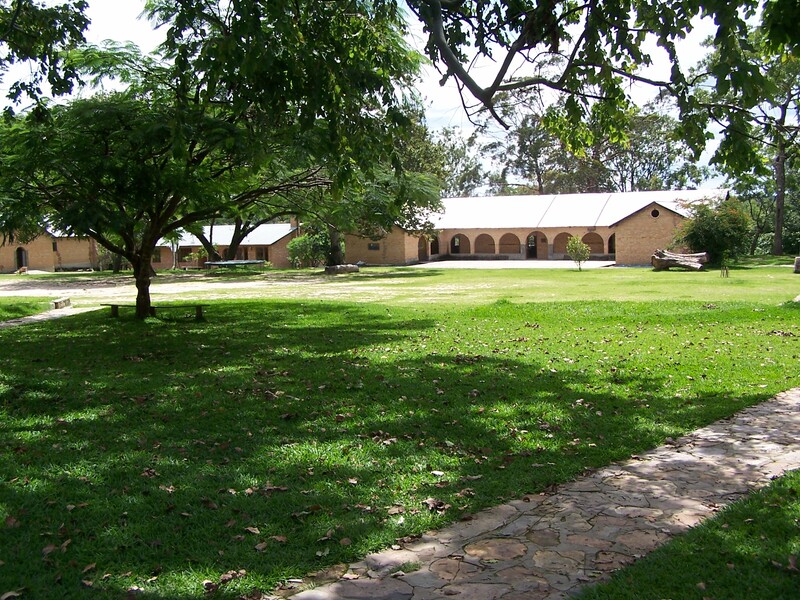 Sakeji School is a Christian primary boarding school situated near Ikelenge in a small finger of land which lies between Angola and Congo, in the remote northern tip of the North Western Province of Zambia. It is 70 kilometres north of Mwinilunga and 600 kilometres (about eight hours drive) from Kitwe. The school takes its name from the Sakeji River, a tributary of the Zambezi River which is itself not far from the school on the Zambia-Congo watershed at an altitude of approximately 1400 m. At this altitude the climate is pleasant, with warm days and cool evening temperatures, especially during the dry season months in June and July. The average annual rainfall is 1400 mm, almost all of which falls between October and April. The school site is very attractive, and overlooks the Sakeji River, which provides both hydro-electric power for the school and a pleasant recreational environment for the children. Despite its remote location Sakeji is able to provide excellent boarding amenities and modern educational facilities. The school is supplied with fresh meat and dairy products by Hillwood Farms, while fresh fruit and vegetables are purchased regularly from local growers or grown in the school garden. Other foodstuffs and supplies are purchased in the main cities in Zambia or imported from overseas. They are then brought to Sakeji by truck from the Copperbelt towns. E-mail contact with the rest of the world is provided through a Satellite link. Cell phone service has recently been extended to Sakeji. Through these means and a short wave radio, daily contact is maintained with other mission stations, with mission support personnel in the Copperbelt towns, and with parents. Sakeji can accommodate up to one hundred students, but presently there are seventy one, representing some ten different nationalities. Almost all of these are boarders between the ages of 6 and 13. The staff usually includes 14 missionary teachers and care-givers from Europe, North America and Australasia, who minister to the educational, spiritual, physical and emotional needs of the children. Other support staff are employed locally by the school to assist with maintenance, catering, laundry and other domestic duties.